ROMAUNT Protective Travel Carrying Case Compatible For K Cup Pods Storage Portable Single -Serve Hand Press Coffee Maker Pu Material Hard Shell Holder Perfect For Traveling Or Camping Holds 9 Count by ROMAUNT at Rat Coffee Shop. Hurry! Limited time offer. Offer valid only while supplies last. Specification: Material: Surface material : PU Eva material : Zipper Size(Approx): 6.85'' x 6.85'' x 2.16'' (17.4 x 17.4 x 5.5cm) (L x W x H). Size(Approx): 6.85" x 6.85" x 2.16" (17.4 x 17.4 x 5.5cm) (L x W x H). Note: K-Cups and other accessories showed on the picture are not included. √INTERNAL STORAGE SPACE :It's the perfect travel and storage solution. 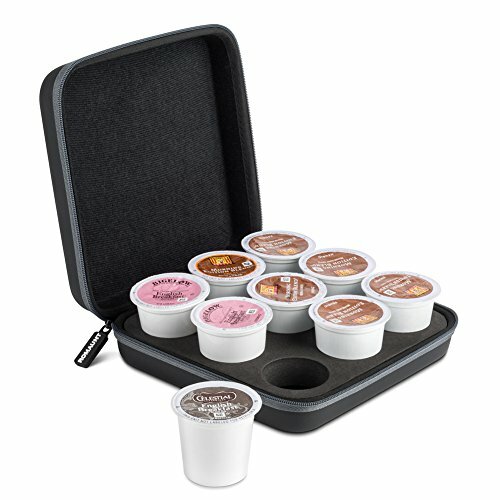 Snug fit, we've specifically designed the castling case with foam to snugly fit K-Cup pods. √STURDY CONSTRUCTION:The handle belt is ergonomic design to fit perfectly in our hands. The zipper is very smooth and doesn't catch around the concerns like cheaper zippers.You can carry this the handle belt of this case with you hand or attach it to suitcase, handbag or backpack of you. √PERFECT PROTECTION: Made of PU material, with high denisity, shockproof, airtight, moistureproof and dustproof features. Protects single-serve K-Cup pods well so you can easliy to pick out without damage. √LIGHTWEIGHT AND PORTABLE :Easy to carry with you, ensuring portability for traveling,camping ,hiking or working, you can be your own barista wherever you go with the convenient carrying handle as well. √MULTIFUCTIONAL: Just need to take out of the foam insert.With room for other items stay together. Protect your nespresso Capsules, scoops, creamer or tea pods for storage as well. If you have any questions about this product by ROMAUNT, contact us by completing and submitting the form below. If you are looking for a specif part number, please include it with your message.